The one with the turkey! The Friends gang is known for its messy Thanksgivings — secrets come out, Chandler’s bad childhood memories resurface and Joey eats way too much meat. The NBC series, which ran for 10 seasons from 1994 to 2004, included plenty of football and famous guest stars in its holiday episodes. (Ahem, Brad Pitt!) 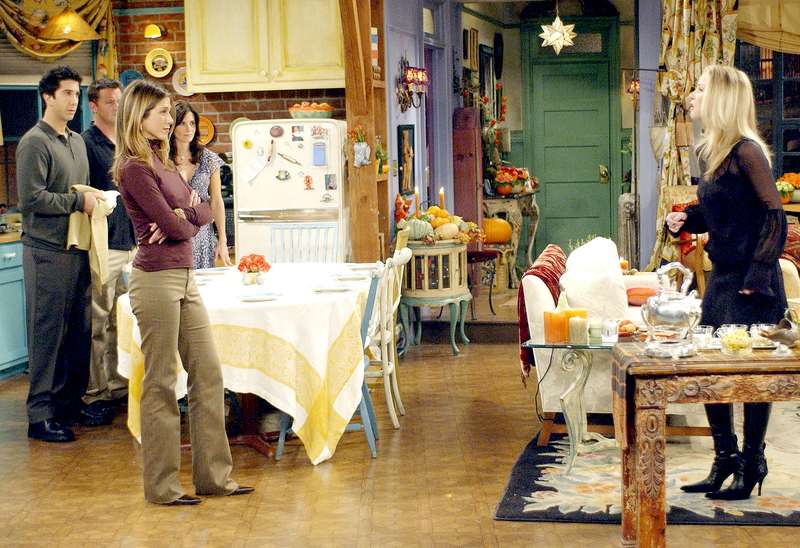 Here, Us Weekly ranks the beloved show’s 10 Thanksgiving episodes from worst to best and even built the ultimate Friends mashup for your viewing pleasure — relive all the moments in the video above! 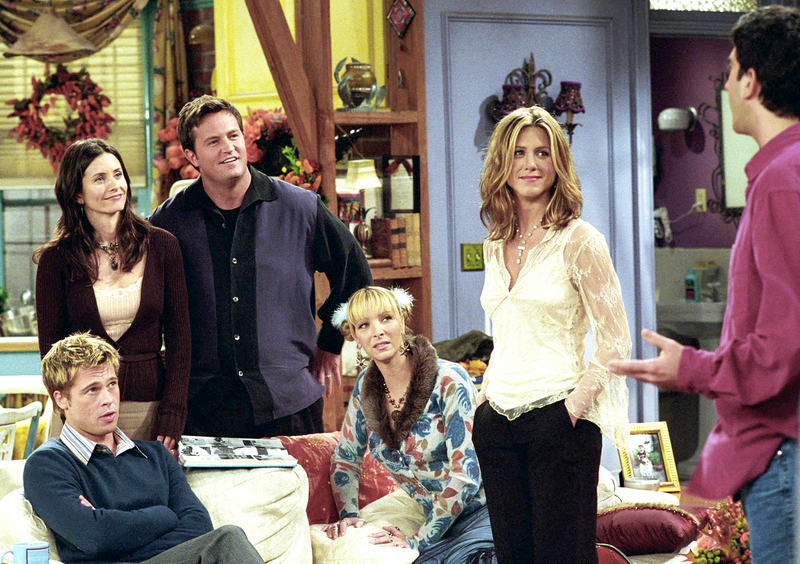 PHOTOS: Friends Stars: Then & Now! Plot: Judging! Chandler (Matthew Perry) confesses that he hates dogs after lying for years that he’s allergic. Rachel (Jennifer Aniston) invites her assistant, Tag, to dinner, but Joey (Matt LeBlanc) blows it by revealing that she has a crush on him. On the Menu: Pumpkin pie, apple pie, turkey, sweet potato stuffed pumpkins, stuffing, cheese platter, green beans. 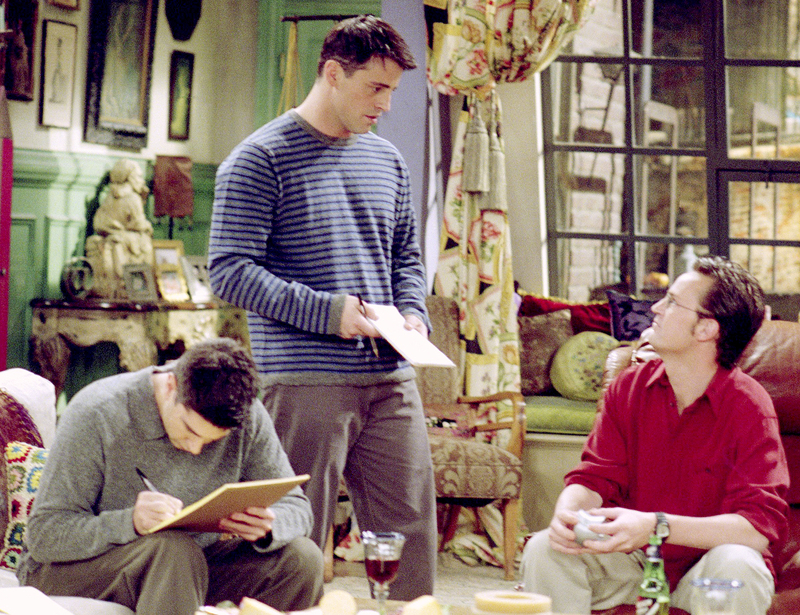 Plot: Chandler spends the duration of Thanksgiving in a box as a way to apologize for kissing Joey’s girlfriend. Monica (Courteney Cox), meanwhile, invites her ex Richard Burke’s (Tom Selleck) son Timothy Burke (Michael Vartan) to dinner. 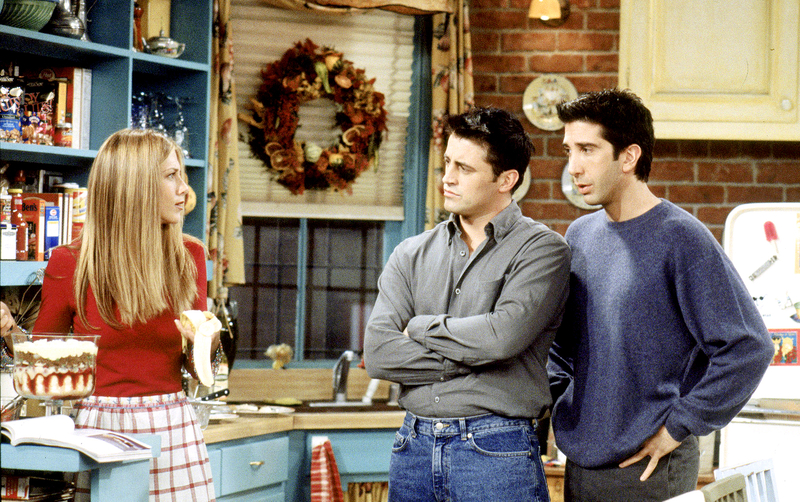 Ross (David Schwimmer) realizes that Rachel sometimes exchanges gifts that she receives. On the Menu: Turkey, mashed potatoes, cranberry sauce, green beans, candied sweet potatoes with marshmallow fluff. Plot: Rachel’s sister Amy (Christina Applegate) unexpectedly comes to town and crashes the gang’s Thanksgiving dinner. Monica and Chandler use their fancy wedding dishes for the first time and learn that Rachel and Ross have chosen them to care for their daughter, Emma, if something happens to them. On the Menu: Turkey, sweet potatoes, bread, green bean casserole, stuffing, cranberry sauce, mashed potatoes. Plot: Love triangle! Ross breaks up with Julie after sharing a romantic kiss with Rachel at Central Perk. His chance with Rachel is shattered, however, when she finds out he compared her to Julie in a pro and con list. On the Menu: No traditional dishes! 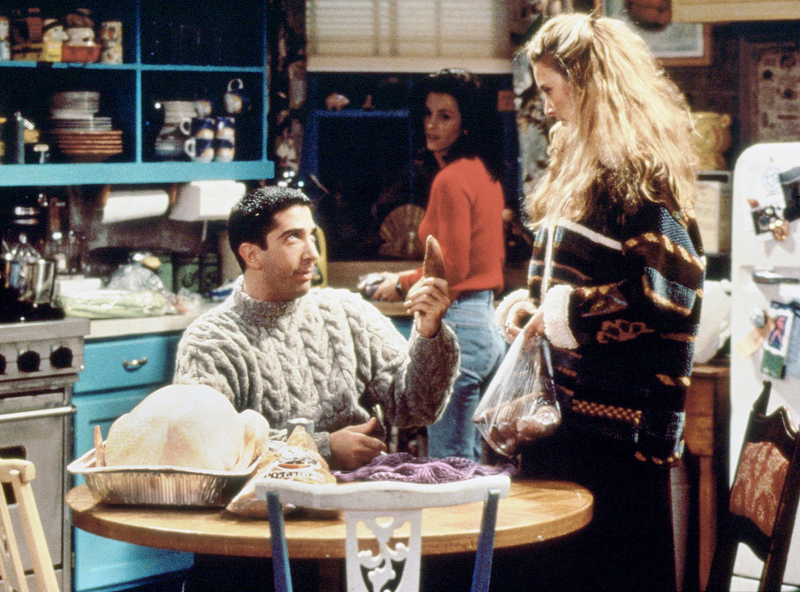 But Monica did try out Thanksgiving recipes using “Mockolate” in hopes of landing a new job: Mockolate cookie crumb crust, cookies, cranberry cake, nut bars and hot chocolate. 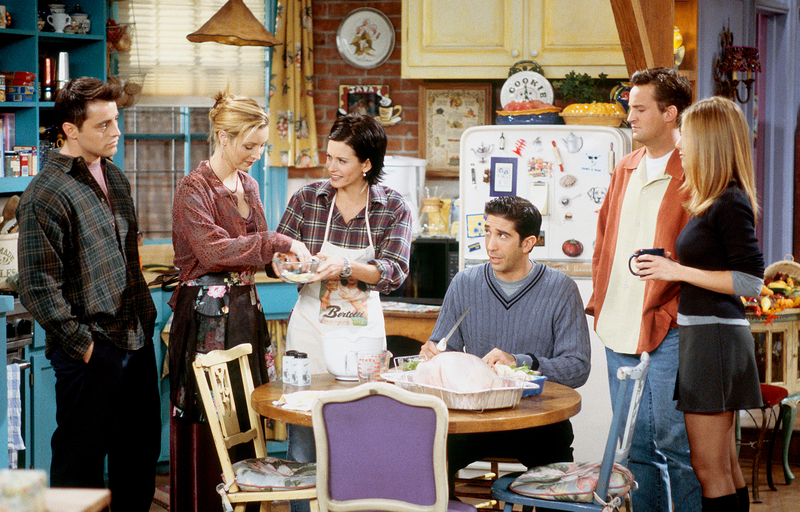 Plot: Monica cooks the gang a Thanksgiving meal — with three kinds of mashed potatoes! Joey sticks around because his family is embarrassed over his venereal disease advertisements and Rachel tries to raise money for her Vail skiing trip. Monica’s feast gets overcooked when everyone runs out to find the Underdog hot air balloon that accidentally broke free from the Macy’s Thanksgiving Day Parade. On the Menu: Mashed potatoes with lumps (Ross’ favorite! ), turkey, yams, cider, stuffing, tater tots (for Joey), mashed potatoes with peas and onions (for Phoebe) and pumpkin pie. Chandler’s meal: tomato soup, grilled cheese and Funyuns. Plot: Monica becomes furious when everyone shows up 45 minutes late to Thanksgiving dinner — Rachel and Phoebe (Lisa Kudrow) brought Emma to a beauty pageant and Ross and Joey attended a Rangers hockey game. In the end, her mood changes when she and Chandler get a call from an adoption agency about a baby. On the Menu: Turkey, soggy stuffing, brussels sprouts, chocolate pies, cranberry sauce, bread, salad, macaroni and cheese. Plot: Flock of Seagulls hair! 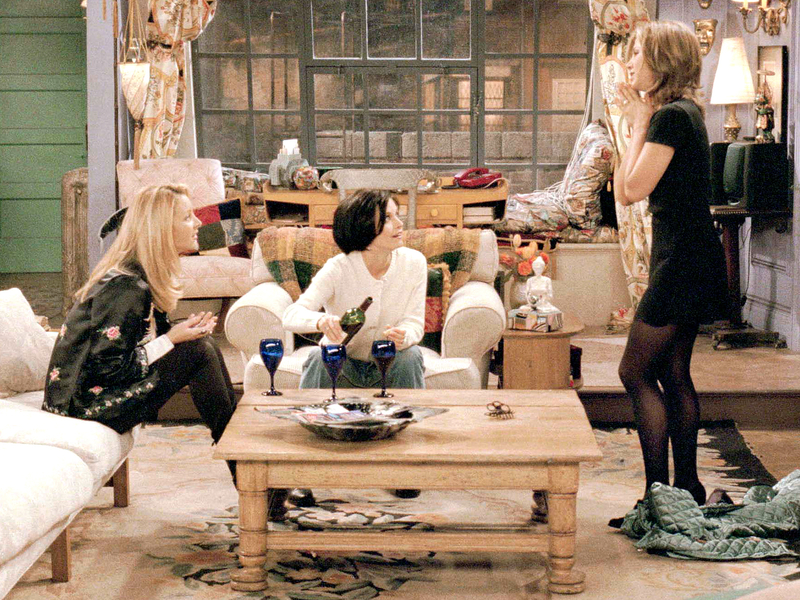 As the group reminisce, Monica reveals that she once overheard Chandler call her fat. She later lost the weight and accidentally cut off Chandler’s toe with a knife while trying to seduce him. 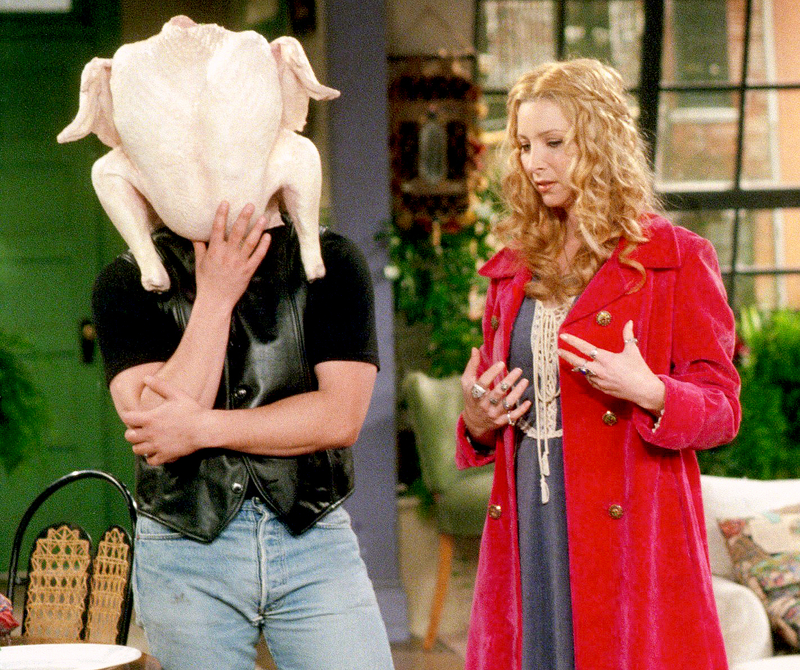 In the present day, Monica tries to cheer him up by putting an entire turkey on her head. On the Menu: Turkey, apple pie, pumpkin pie. Plot: Monica’s parents finally find out that she’s living with Chandler. Rachel takes over dessert duties and accidentally combines the ingredients for a traditional English trifle and Shepherd’s pie. On the Menu: Turkey, cranberry sauce, green bean casserole and Rachel’s infamous traditional English trifle: Layers of lady fingers, jam, custard, raspberries, lady fingers, beef, peas and onions, custard, bananas, whipped cream. Plot: Cue “Let’s Get Ready to Rumble”! The group decide to play football in the park. Monica and Ross — who were forbidden to play ever again after Monica broke Ross’ nose during a childhood game — face off once more to see who will win the Geller Cup. Chandler and Joey, meanwhile, fight over a Dutch woman. On the Menu: Turkey, marshmallows in “concentric circles” on sweet potatoes, stuffing, mashed potatoes. Plot: Welcome, Will! Monica invites an old high school friend named Will Colbert to Thanksgiving dinner. The only problem? He hated Rachel back in the day and even cofounded an “I Hate Rachel Green” club with Ross. (Will was played by Brad Pitt, who was married to Jennifer Aniston for a year at the time.) During the walk down memory lane, it’s revealed that Ross hooked up with their 50-year-old librarian Anita. Tell Us: Which was your favorite episode?